On Saturday 13th April the Meeting Art Firenze was presented at the Auditorium al Duomo in via dei Cerretani n.54 (Exhibition open every day from 13th to 28th April). The exhibition and the cultural project are curated and with the artistic director of graphics, photographer, and Roman artist Paola Biadetti, in the various rooms of the Auditorium there are as many as 16 artists from Italy and abroad. At the foyer of the Auditorium there is the Uruguayan but Roman artist of adoption Omar Olano with a personal exhibition, the literary café is attended by the artist Franco Tarantino with a personal dedicated to signs of the zodiac, the Meeting Art exhibition at the Sala Borselli: Craia Silvio, Angelini Rossana, Bavetta Gaspare, Butera Sandra, Caglioti Sandro, Gatteschi Lucio, Iallussi Sevastì, Maglio Maurizio, Maiorini Piergiorgio, Natale Andrea, Raggetti Tony, Rampazzo Federica, Sarchini Donatella, Serafini Elisabetta. The presentation was made by Professor Luca Filipponi President of the Menotti Art Festival Spoleto who announced the latest news on the Kermesse Spoletina and on the imminent participation of the same at the Venice Biennale 2019 (Presentation May 2019). Professor Luca Filipponi was assisted by the extraordinary participation of Professor Simone Fagioli, philosopher and art historian. 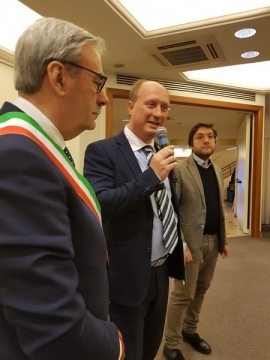 The event was attended by Alessandro Calonaci for an artistic performance, Fabrizio Borghini with the journalistic special of Toscana TV and Toscana Cultura, the extraordinary presence of the Mayor of San Miniato Vittorio Gabbanini who received the award "Communicating Europe 2019". During the event the Artist Franco Tarantino performed a Body Painting performance with the model Elisa Falorni. 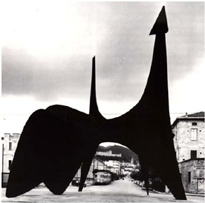 Professor Luca Filipponi is pleased with the event: << The Menotti Art Festival Spoleto will be on tour throughout 2019 and is requested by many municipalities but also by international Kermesse such as the Venice Biennale, Basel Arte Expò and by National States such as the Wuhan Biennial - China and from numerous American Universities, with which there is a project for the constitution by June of the homonymous Cultural Foundation >>.